My good friend Illya of LiveRoots.com sent me a gift several years ago of an antique photo album. The Album has had a rough life, and needed a good home, so Illya bid on it at a New Jersey auction, won the album and shipped it to me here in Canada. The album has slots for 64 cabinet cards, and one tintype. 2 Cabinet Cards are missing, for a total of 63 ancestor family photos in this album. 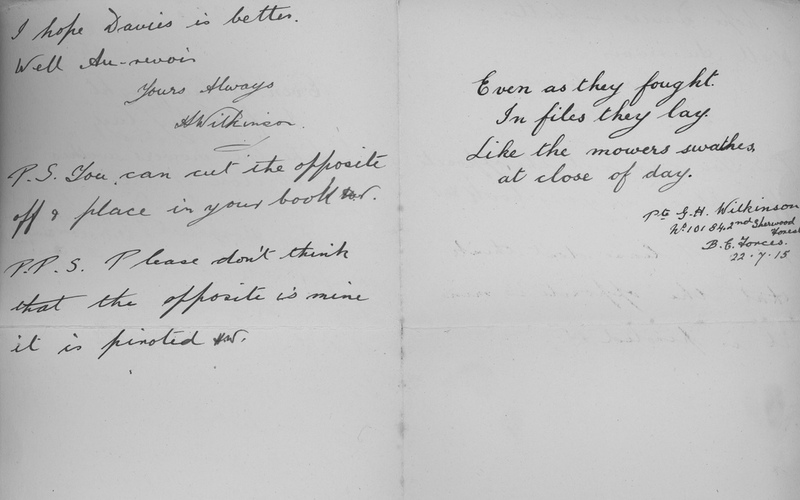 15 of the Cabinet Card photographs were identified with writing on the album pages. With the identification of those 15 photos and the clues from the photographers who took the photographs, I was able to find the family in the census for Chicago Illinois and determine that this album belonged to the Timmerman Family. The Timmerman Family Photo Album is full of beautiful photographs, most taken in the period 1890 - 1910. Most of the photos were taken by photographers in Chicago Illinois - Morrison, Jaeger, Hoffman Studios, Vahlteich and others. A few were taken in Omaha Nebraska. I wondered how a Chicago Photo Album over 100 years old ended up at a New Jersey auction, but research found that one of the Timmerman daughters (Bertha Timmerman) married a man named George Fichtner and moved from Chicago to Boontown New Jersey sometime between 1910 and 1920. No doubt the album was cared for by this daughter and her descendants for many years. Olive Tree Genealogy has scanned several of the photos and published them online for all descendants and interested researchers to enjoy. 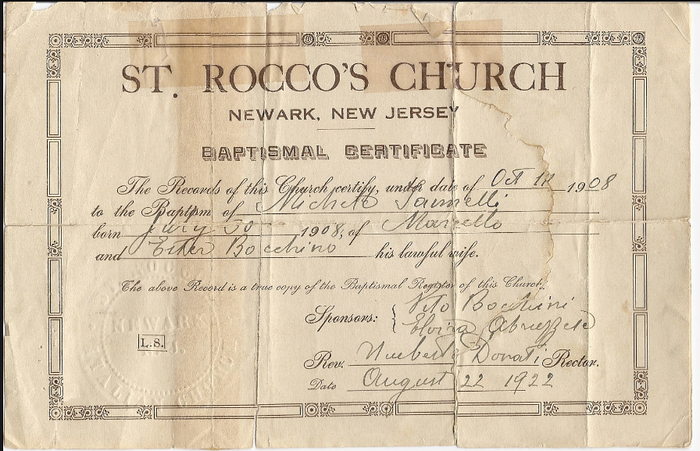 I will be scanning all the photos and placing them all online in hopes that genealogists will recognize an ancestor. I've also written up the genealogy research I did on the Timmerman family and published it online as well. Hopefully interested descendants will enjoy this look into the family photographs of more than 100 years ago. 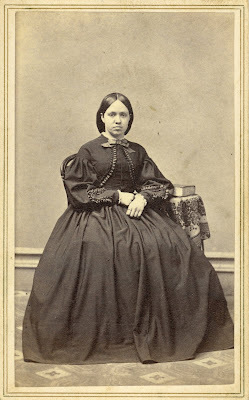 There are 63 other antique family photo albums (mostly from the Civil War era) online on Lost Faces on Olive Tree Genealogy website. More are being added as I scan them. 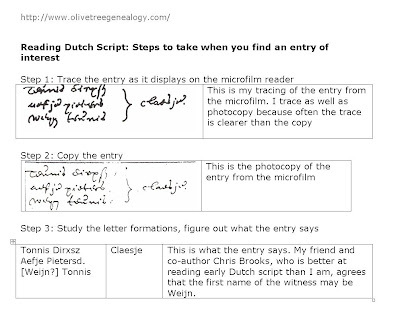 If you have ancestors who settled in New Netherland (now New York) in the 1600s, you will undoubtably eventually find yourself struggling with Dutch words and handwriting. You may even venture into research from the Amsterdam Archives Church Records which have been microfilmed. 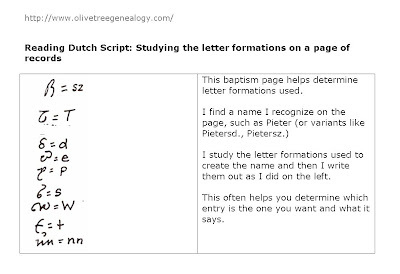 Amsterdam Doopregisters (Baptism Registers) follow a fairly consisent format. They show names (sometimes an occupation) of father, mother, child and sponsor(s). You don't need to read Dutch, you only need to be able to pick out and read the names of the individuals you are interested in. But it is more difficult than it sounds. 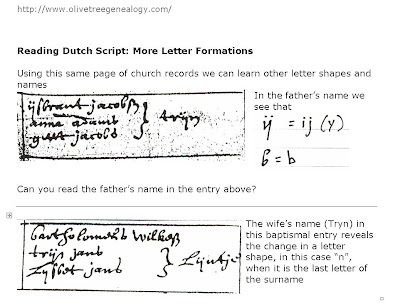 17th century letter formations are very different than what we are used to. Dutch names and spellings are something new to many of us as well. 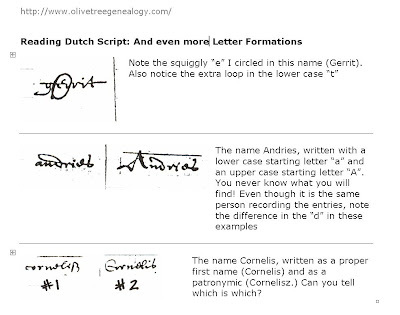 As I was struggling to learn how to read this early Dutch script, I made up a little booklet which I add to each time I figure out something new. I use my little home-made guide to help me interpret what I am looking at in these early (1600s) records. Other researchers asked me to send them copies of my notes and examples, so I made up a mini-tutorial. I am not an expert, I muddle along as best I can, but researchers I sent the tutorial to seemed to find it helpful, so here it is. I hope that if any of you are starting to dig into those distant records you will find this at least interesting if not helpful in some small way. I'll add to these Blog notes as I get the pages of my little guide scanned. Remember, it's FUN and it's NEW and it can be intimidating but just keep on plowing through one step at a time. 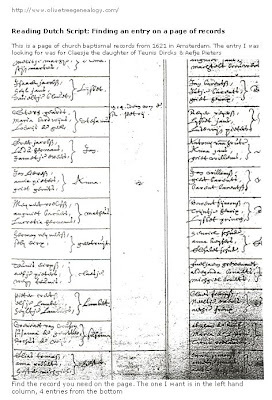 This is a page of church baptismal records from 1621 in Amsterdam. The entry I was looking for was for Claesje the daughter of Teunis Dircks & Aefje Pieters. This is a relatively easy page to read compared to some! The handwriting is neat and legible, the filmed record is not dark, and the size of the writing is not too small. The 11th page of the Flynn family album has some names. The left photo is labelled "Theresa - Fred - Joe" and underneath an address "51 Robert St." The second photo is labelled "Joe age 2 on Robert St."
This is one of my favourite CDVs (Cartes de Visite) from the Fowler Merchant Civil War era photo album in my personal collection. It was taken during the Civil War - if you look carefully you can see this young lady's snood - a netting worn over the hair at the back of the head. 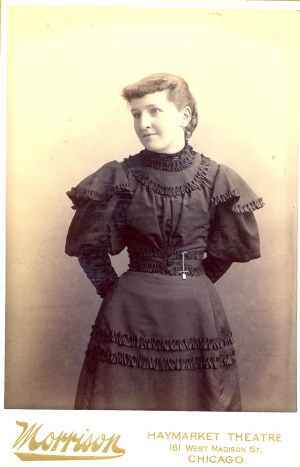 Her hair is carefully slicked down and parted in the center - another sign of 1860s women's hairstyles. Her bolero jacket was also popular during this time. Also note the dropped shoulders, full sleeves narrowing at the wrist, and the full skirt, but loosely draped, not over a hoop. The plain background and patterned floor are further clues to help date this photograph. 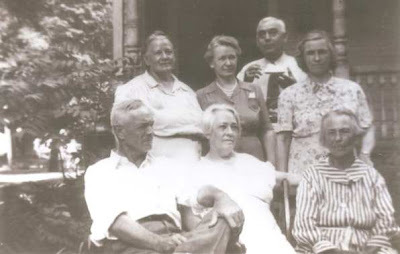 You can see the full Fowler-Merchant Family Photo Album online at Lost Faces. Many years ago I bought a book at a local Garage Sale. Inside was the owner's name "Millicent Lynn", and a hand-written genealogy. I knew Millicent slightly, she was an elderly woman in the town where I lived in the 1970s. Millicent was a gentle lovely-looking woman who looked like Helen Hayes and always wore gloves, a dress, and carried a purse over one arm much like Queen Elizabeth. Millicent's son and grandson owned a local business in our small town. It was through Millicent's grandson that my husband and I met some some twenty years later. My future husband worked for Millicent's grandson and when I published my first book The Van Slyke Family in America: A Genealogy of Cornelise Antonissen Van Slyke, 1604-1676 and his Mohawk Wife Ots-Toch, I was directed to his office for assistance. 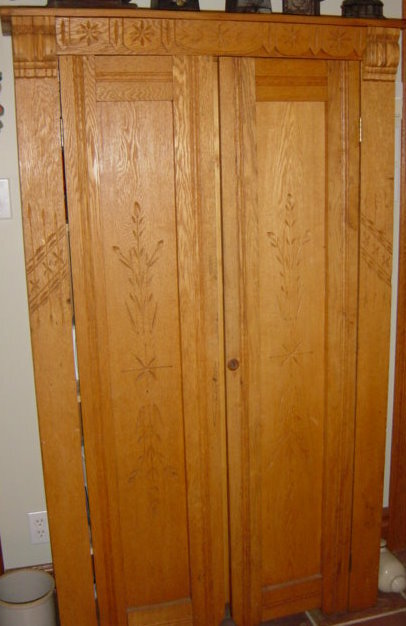 After our marriage I discovered that my husband owned an antique cupboard that once belonged to Millicent. He also owned the WW1 army helmet that once belonged to Millicent's husband, and a very old black top hat inscribed inside the band with Millicent's husband's name (George Lynn). 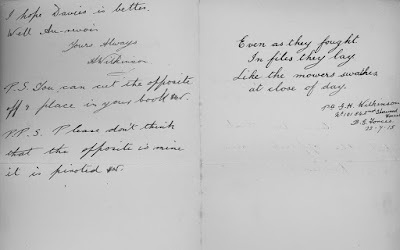 With all these connections and treasured objects in our home, I began to feel that we owned a little piece of Millicent and George's lives, and that to complete the circle we needed to find out more about their lives and ancestors. This is George Lynn's WW1 helmet that is part of my husband's WW1 Collection. I also found George's WW1 Attestation Papers and many census and vital records for George, his parents, his grandparents and so on back to 1814. Now I feel that the journey is complete and I will pass this coincidental genealogy on to Millicent's grandson. I'm excited to announce my four new family tree books now available on Amazon. If you have Caspall, Laming, Hubbard, or Wildbore ancestors from Kent England you may find these books of interest. This page is labelled "Carillon 1931" The photo on the left is labelled "Mrs. A. Pope" but it is not clear if this relates to all three photos or not. I've talked previously about surnames that changed (either deliberately or accidentally) over the years. This makes research into those families challenging! But what about first names? Besides the usual nicknames (Bob=Robert, Jim=James, Cathy=Catherine) that we find as we research our ancestors, what other problems might we encounter along the path of our family tree? How about ancestors with first names that have absolutely nothing to do with the name they were given at birth! 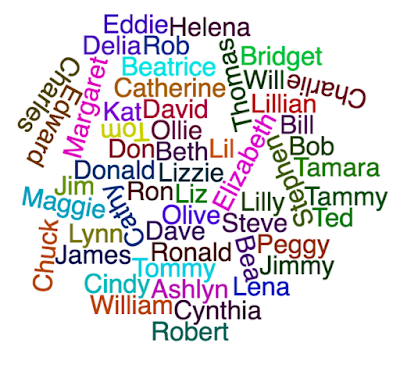 These are people whose commonly used first name is not a derivative or nickname or anything other than some invented or pet name used by family and friends. You can't assume that just because Grandpa was called Charlie that his actual name was Charles. Grandma might have been called Bobbie by her friends but does that mean her name at birth was Roberta? NO! Let me give you some actual examples in the family trees of my husband and myself. 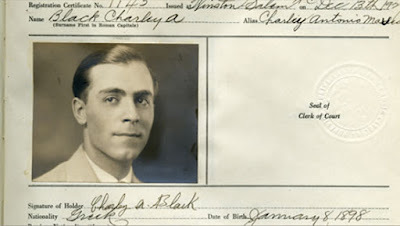 My husband's grandfather was Charlie. Everyone called him that, friends and family alike. His wife called him Charlie. That was the name on their mailbox and in the local phone book. So of course we assumed his given name was Charles. But his birth registration found a few years ago showed that his actual first and middle names were Leon Thomas. How did he get the nickname Charlie? No one knows and he is no longer living to tell us. It's a family tree mystery that will likely never be solved. My own grandmother was Dolly. As a child I assumed that was her given name but in reality her name was Ruth Ethel. When I asked her about her name she told me that when she was born she was so tiny that her mother thought she looked like a little doll. That was what her mother began calling her, and the name Dolly stuck with Grandma her whole life. Other examples are my friend Bobbie whose brother could not pronounce her real name of Celia. He called her "baby" which sounded like "Bawby" and thus Bobbie was the name used by family and later her friends. It was many years before I learned her real name! 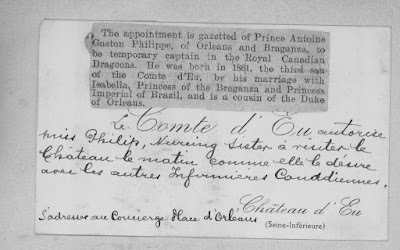 So don't get too stubborn about refusing to believe that the genealogy record you found for a man named Achilles is in fact your Belgium great grandfather Archie (another example from my husband's family tree) when all the facts fit! In this example, once we had the name Achilles pronounced by a native French speaker, we realized that it sounds like Aw-SHEE, which of course can easly become Archie. 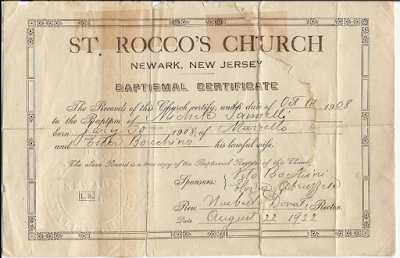 And thus my hubby's great grandfather Archie was indeed the man named Achilles baptised in Tielt Belgium in 1894. Do you have examples of such names? 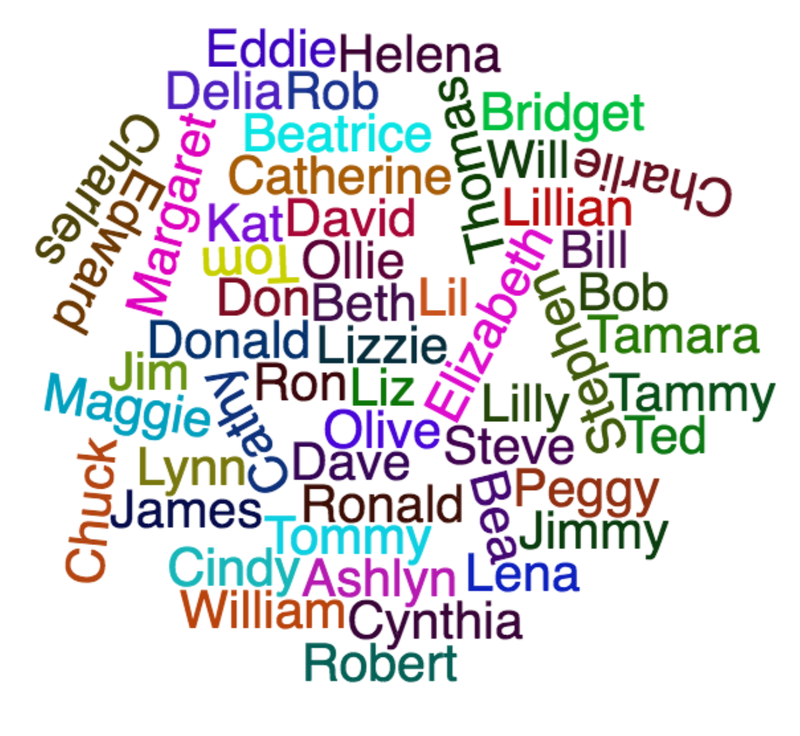 Tell me about the names in your family tree, not common nicknames such as Jim for James, Bob for Robert, Bill for William, Cindy for Cynthia, etc., but pet names or invented names that you discovered for an elusive ancestor. Use the comment section here or write a post to your own blog to share your stories. Forensic genealogist Morton Farrier reluctantly takes on a case involving a woman born in World War 2 England who is searching for her biological parents. What follows are numerous twists and turns, multiple story lines and in general enough mysterious happenings to keep the reader guessing and on the edge of his/her seat throughout the entire book. Goodwin combines thorough genealogy research techniques and various online sites to satisfy any genealogist. As well the historical aspects of the book are well-researched and satisfyingly detailed. All in all a good read from this author. * Muster Roll NJ Volunteers Cpt. Shaw's Co.
* Muster Roll NJ Volunteers Cpt Hopkins Co.
* Muster Roll NJ Volunteers Cpt Shaw's Co.
* Muster Roll NJ Volunteers 5th Battalion Cpt. Crowell's Co.
* Muster Roll NJ Volunteers 1st Battalion Cpt. Millidge's Co.
Lizzie, the blacksheep of the Vollick family, was known as rebellious and stubborn. Her birth in 1863 was uneventful. There was no indication that her nature would prove to be much less compliant than her ten brothers and sisters. Baptised as Mary Elizabeth to parents Isaac and Lydia Vollick, little Lizzie grew up in a bit of a rough and tumble, yet loving, family. What led her on her path to her eventual death of starvation at the age of 51 with only her 17 year old son at her side? We might look at her involvement at the age of 15 with Stephen Peer who was a drifter some 10 years her senior. Stephen was considered a no-good drifter by Lizzie's parents and they did their best to keep the two apart. It did no good and a few months after her 16th birthday she eloped with Stephen. That was the start of Lizzie's downfall. Her family disowned her and her parents never spoke to her again. Stephen couldn't hold a job and over the next several years he and Lizzie moved from town to town. By the time Lizzie hit her 33rd birthday, she had brought 9 children into the world. Stephen took whatever work he could find but the family lived in poverty. Not many details are known of their life for the first 17 years of their marriage but in June 1895 Lizzie's husband Stephen was attacked by a neighbour and the neighbour's son, struck repeatedly in the head with an axe and ended up in the local hospital with a serious skull fracture. He was not expected to live but managed to pull through. 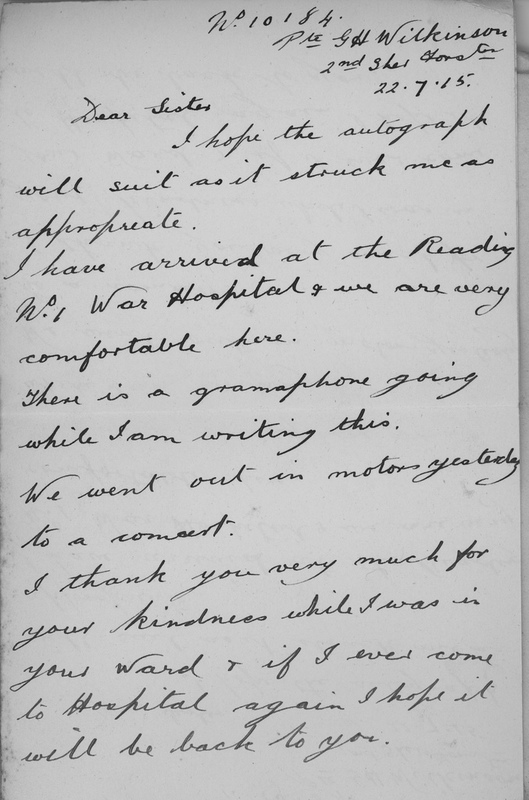 A court case followed but Stephen could not attend due to his injuries. As it turned out, the attack began over an ongoing argument over the use of a water pump on the property where Stephen rented a small house. 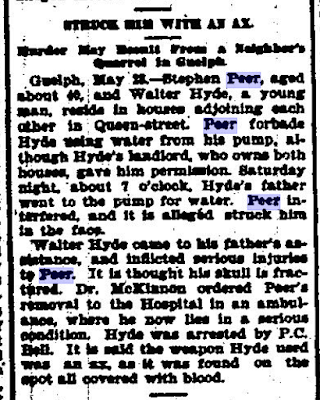 When the neighbour, a Mr. Hyde, tried to get water that hot summer day, Stephen attacked and punched him. 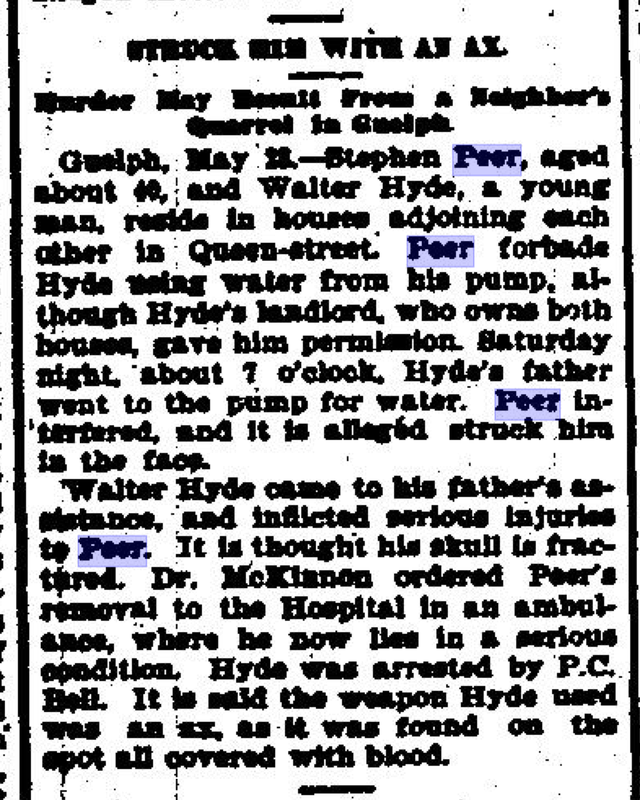 At that point Hyde's son ran out of his house with an axe and the two men beat Stephen using the axe and their fists. Two years later, Stephen died of Typhoid Fever, leaving 34 year old Lizzie an impoverished widow with 9 children between the ages of 1 and 11 years old. The family was so poor that Lizzie could not afford to bury Stephen so the city stepped in to assist her financially. Besides the tragedy of losing her husband and being left in such destitute circumstances, what has always struck me is how the newspaper did not even get her husband's name right. We know this is the correct death notice for Stephen as his death certificate confirms the dates. It may be that his middle name was Levi in honour of his father, and perhaps he was known by that name. My grandmother was the oldest child when her father died - being just 11 years of age. I knew her quite well, as she lived until I was 15 years old. She never spoke of her parents, nor of the hardships she undoubtedly suffered after her father's death. But back to Lizzie. One by one her children married and moved away. Eventually she was left with only her youngest boy Philip Edgar. When he was just 17, Lizzie died, leaving him an orphan. She was just 51 and died of starvation. 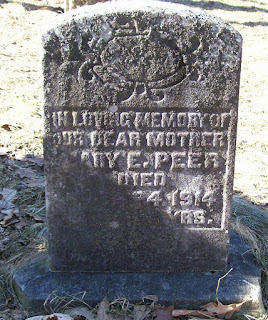 Shortly after her death in May 1914, young Philip Edgar joined his older brothers in the Canadian Expeditionary Force, fighting overseas in World War 1. He was killed in France shortly before his 21st birthday, bringing to an end the story of Lizzie and her life. I am glad she didn't live to see her boy die. But she certainly had a traumatic ride through life. Alien Registrations are a valuable genealogy resource for finding ancestors. An alien was any individual who had not naturalized. From November 1917 to April 1918 all those considered alien enemies were ordered to register with the U. S. Marshal in the county where they lived. All states were required to complete alien registrations but not all records were kept. Registrations from 1940-1944 are on microfilm at INS. To obtain copies of AR-2 Files, you must submit a request identifying the immigrant by name, date of birth, and place of birth to the INS (now BCIS), Freedom of Information Act program. When asking for genealogy help on a forum, a Facebook group page or in an email, it is wise to learn how to write a good query. 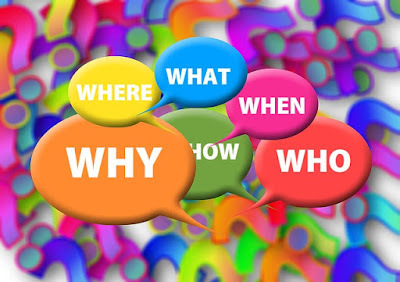 A good query is bound to get you good results, other subscribers are more apt to respond. A bad query will be ignored or deleted. Good queries are clear, precise and have enough information to allow readers to help you. Remember the 3 Rules - Name, Dates and Location! Be sure to include all three in your query. What is your ancestor's name? When was he born (or married or died?). If you don't know, make a guess - you must know if he was born 1820-1840 for example, versus being born 1910-1920! Where did your ancestor live or settle or where was he born? Be sure to include this information in your query. He married Mary (surname unknown) circa 1859. Known children were Jesse, James, Sarah & Mary all born Pennsylvania in 1860s. I am looking for Homer and Mary's Marriage Record, hoping to find her surname and their parents' names. This photo was tucked inside an antique Civil War Era Family Photo Album I purchased. Inside the album the inscription read "Sarah J. Taylor Album Presented by Thomas Taylor June 1871"
The Flynn family photo album has another page labelled "Carillon 1930". Back in 2000, I was approached by the Jewish Archives in Recife Brazil, asking for my help in identifying the 23 Jewish refugees who were on board the ship St. Charles sailing from Recife to New Netherland in 1654. According to the Archives in Recife, the first Jewish Synagogue in America was built in Recife, this is known from archeological excavations. It is not clear if Solomon Pietersen was on board the ship so I have not added his name to the list. There are some published materials on the Jewish refugees who came from Brazil to New Netherland, but I have not attempted to find them. 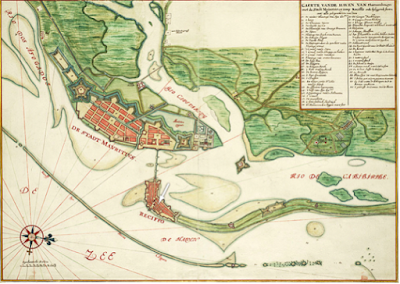 I have found the names of several other Jewish settlers to New Netherland who may have been passengers on St. Charles -- but they may also have arrived before or after the Recife refugees. The Jewish Archives representative informed me that they plan on establishing a Jewish Center Study at the old Synagogue, and they will place the information and sources I find for others to use. I do not know if this happened. On January 26, 1654, approximately 150 Jewish families of Portuguese background fled the city of Recife, in Pernambuco, Brazil. By September a number of these refugees had established the first community of Jews in the future United States. Known as Sephardim (Jews of Spanish-Portuguese extraction), theirs was a complex saga. After 1497, the kingdom of Portugal outlawed Jewish life, causing many to flee to Holland where a climate of acceptance prevailed. From there, some migrated on to Pernambuco, a colony of the Dutch West India Company in modern day Brazil. Their community flourished there until the Dutch eventually surrendered Pernambuco to the Portuguese and the Sephardim were again forced to flee. (Summer 2004) issue of "de Halve Maen", the quarterly publication of The Holland Society of New York. It is Professor Leo Hershkowitz' article, "By chance or by choice: Jews in New Amsterdam 1654", pages 23-30. Herkowitz says that de Peereboom (The Peartree) sailed from Amsterdam to New Amsterdam on 8 July 1654. New Amsterdam is now New York City. FN 1: C.J. Wasch, Doopregister der Hollanders in Brazilie 1633-1654, (1889), Adriaen Crijnen Post, Clara Moockers. Wt Christoffel ---, Andelijina Caron, Dorothea Montanier. Albert George Marriott and his twin brother were my 3rd cousins, twice removed. Both were born in Guelph Ontario in June 1882. The winning of a baton contest in the old Guelph skating rink gave the Marriott twins their start for 60 years in show business. They started off in Downie Brothers Circus as jugglers on bicycles but in later years developed an arial act, and gained international fame. In 1896 the twins joined the Harry Lindley Dramatic Company, playing in Canada up to Dawson City in the Yukon. 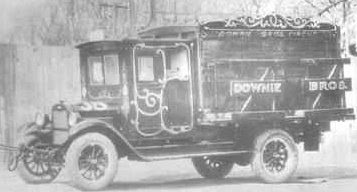 Engagements with other companies included the Andrew Downie Company of Vancouver. It was with the Downie circus that the Marriotts orignated their bicycle juggling act which they repeated at the opening of Tony Pastor's Theatre in New York. "We played with the Orrin Circus in Mexico for three years then going to the Million Dollar Theatre in Buenos Aires, Argentina for six months." 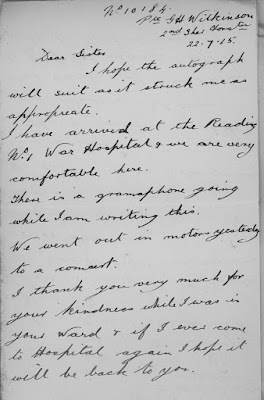 [letter from Al Marriott] ..."My research found Albert and his wife Maud as passengers on board the SS Verdi from Buenos Aires to New York. They are listed as "theatrical artists"
"Next came several months at theatres in Havana Cuba. 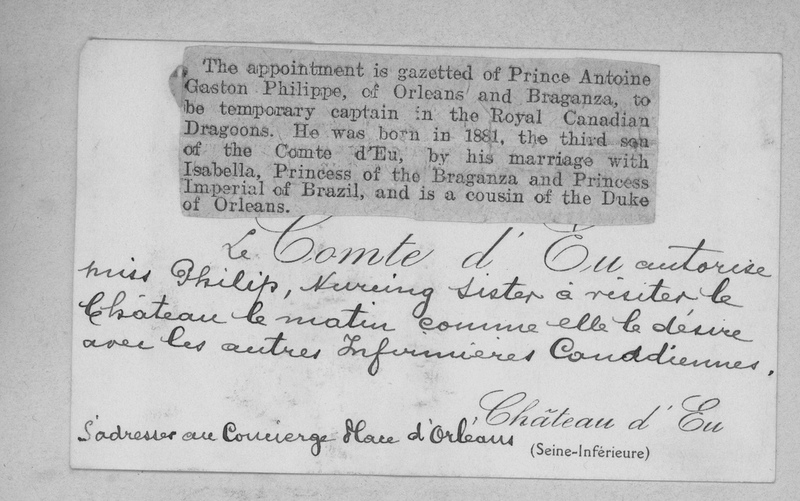 On five occasions we played return engagements in front of the grandstand at Toronto Exhibition and making appearances before the Prince of Wales" [letter from Al Marriott] Using Ancestry.com , I found Albert and his twin brother (whose name is uncertain, in various records it appears as Menard, Murray and Manet) sailing back to New York from Havana Cuba in 1907. Among the engagements was one with President Truman at a county fair in Missouri and the following week at Washington DC. There followed references in Al Marriott's letter to numreous other engagements including seven years at the Hippodrome in New York. 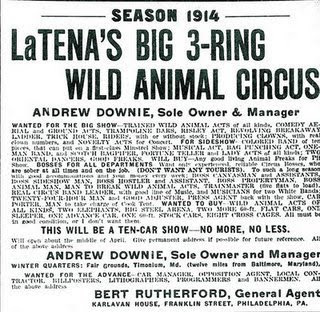 This ad was found in the Billboard on November 15, 1913 on page 23. Searching for Albert, his wife and his twin brother in the various genealogy records has proven rather challenging. To date I have found Albert and his twin's birth records in the Ontario Vital Statistics. They are found in 1891 and 1901 census for Guelph Ontario. Interestingly in 1901 Albert, age 18 is listed as a Hardware Clerk while his brother is listed as a photographer. In the 1930 census for Michigan, Albert and his wife are listed as vaudeville performers. The various ships passenger lists I have found them in lists them as jugglers, arial artists and theatrical artists. I am still hunting for a photograph or poster of the twin brothers' act.